Which part can I use it for? 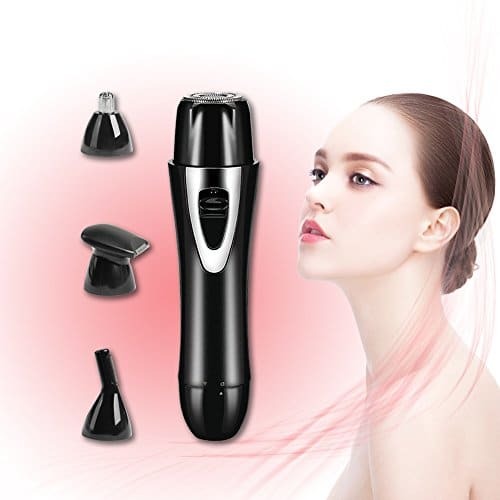 The best choice especially designed for you.From facial hair to eyebrow and nose hair.Instead of razor hair remover or wax type device.Time to say goodbye to your annoying hair without any pain.No need to be hesitate on making the decision. 1.Before using it,don’t forget to charge it ready. 2.Push the button on the body,get it start. 3.Keep it spinning on your face,against the direction of the hair growth. (You can also use it dry&wet). 4.Turn it off and cover the lid after your using. Hair and other debris may pile up inside the device,so should be cleaned regularly (3-4 times’ use). It’s easy to clean.Follow the anti-clockwise to unscrew the head,then using the brush in package to wipe debris out.It’s ok to wash the head with water but not the body. * All IN ONE DEVICE: FOUR interchangeable heads ideal for trimming all extra body hair, such as your face, arm, leg, bikini line and also other body area. Just need to buy one set and you will get four different trimmers. Best choice to save money. * EFFICIEN&PAINLESS: Unlike traditional chemical epilating methods and forceps which takes much time and bring great pain, This women shaver can remove unwanted hair efficiently with no pain or discomfort because of its sharpest blades. * WATER-RESISTANT&USB CHARGING: Washable and removable cutter heads, easy to clean. Allows you use this women shaver in the shower. For long lasting performance, pls just simply wash the attachments after use. USB charging function provides a easy charge by any computer, adapter or power bank. * UNIQUE DESIGN&EASY TO USE: Impressed with its bright color and popular outline; This women shaving kit is designed specially for women. It is small and portable. Simply use in the convenience of your own home, at work, or on vacation. * 100% LIFETIME GUARANTEE: Please Contact us if you get occasional defective item, damaged package with missing parts or you have doubt of the order. Lifetime worry-free product guarantee for every purchase from us. Home SPA style – Stainless blade helps to cut your hair efficiently and accurately.9-leaf blades leave no hair on your skin.Enjoy a flawless hair remover service by yourself at home. 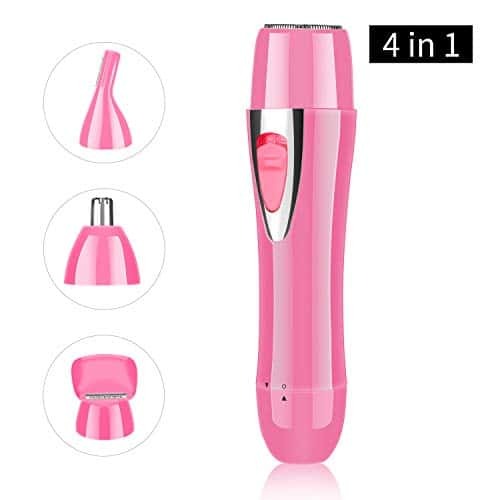 Meet with all your needs one time – 4 in 1 design with facial hair remover/nose trimmer/eyebrow razor/hair shaver.Take it with your trip.No more annoyance from your package. Enjoy a LIGHT date – It’s in a mini size (1.2′ x 4.7′) that you can easily take it in your purse.Have a hair remover service anywhere or anytime.Just keep you a flawless beauty. Sustainable usage – Rechargeable battery.Charge it one time can keep working for over 3 hours.Reliable ABS material also offer you a lifelong service. Easy Replacement & Washable Heads – 4 kinds of heads for replacement, just rotate the heads to on and off. Rinse the heads under water tap, but not soaking it fully in water for long time.